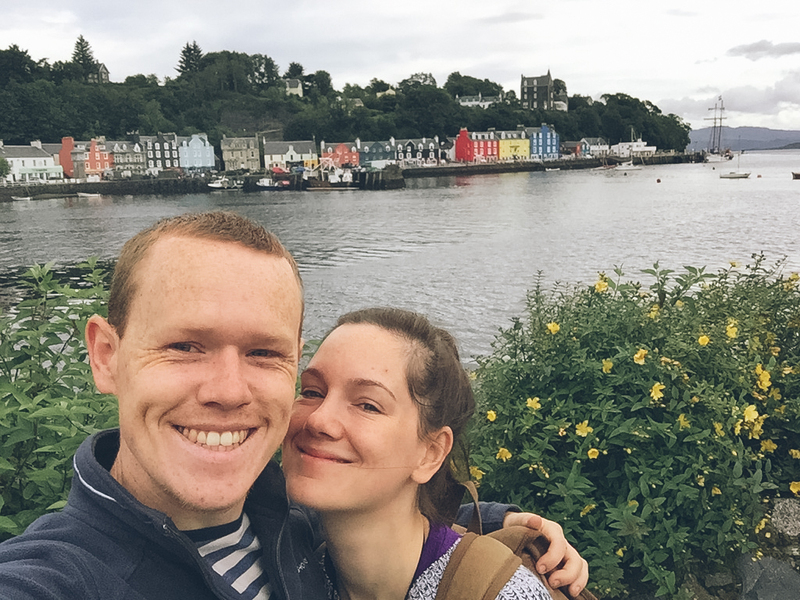 Living in Scotland we really are spoiled for choice when it comes to holiday destinations & I was very excited to visit the Isle of Mull with Chris in August 2015. I had expected to enjoy the trip, however discovered that there was so much more do than I had originally thought. 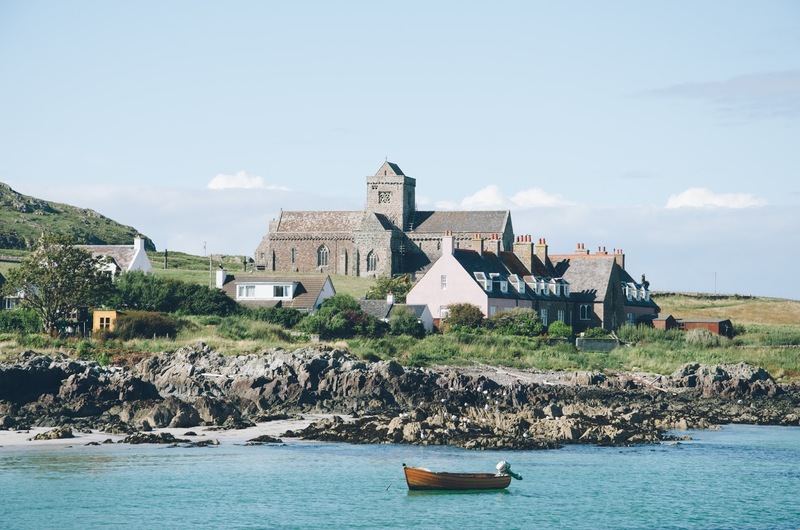 Think Island life is boring? You couldn’t be further from the truth. 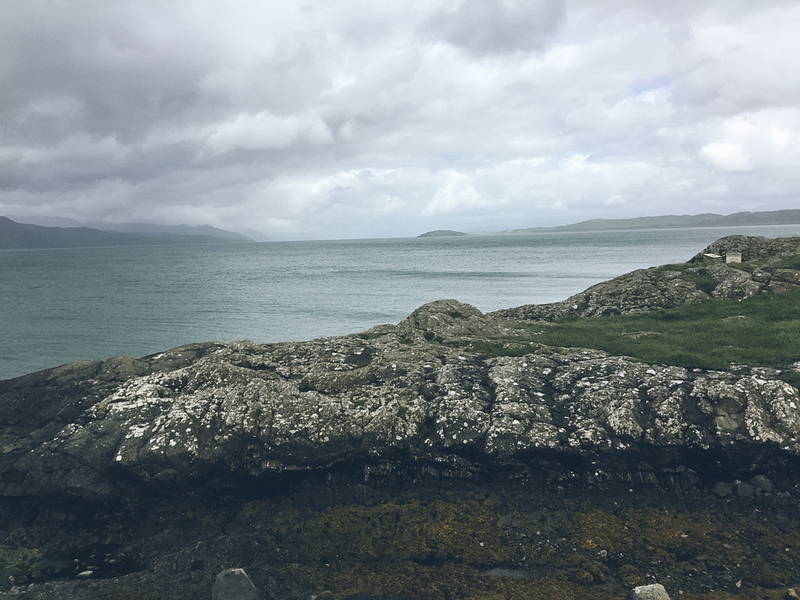 I will list my top places to go / things to do in Mull below and hope you find them useful for planning your own adventure. This is the route we chose, as not only is the ferry a heck of a lot cheaper but the drive is also stunning. 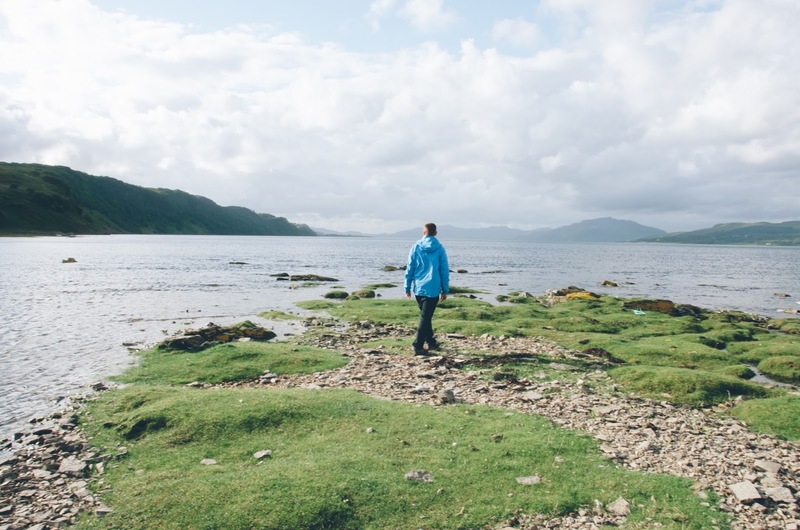 Setting off from Glasgow you can take in the scenery of Loch Lomand & the Trossachs and Glencoe en route. Glencoe makes the perfect pit stop / lunch break & I would recommend coming back or stopping over in this area if you have the time. 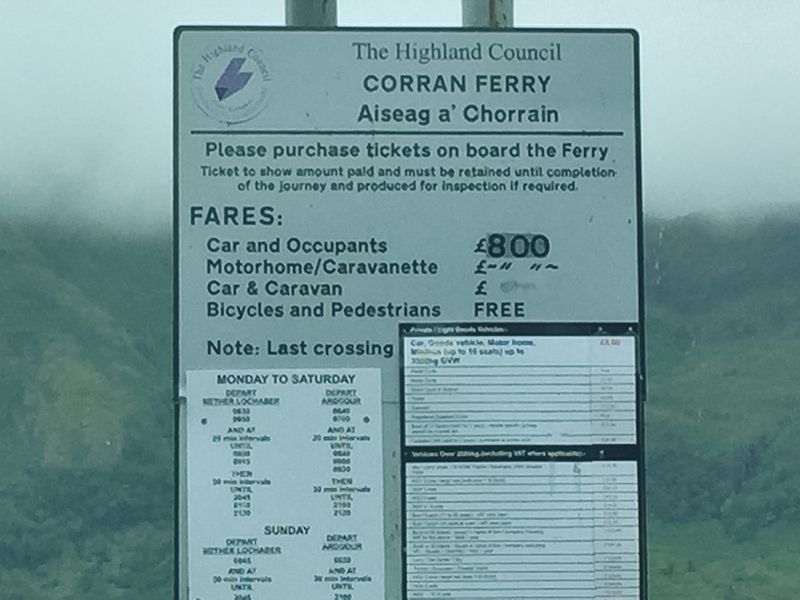 The Corran Ferry is a very small crossing located a few miles from Glencoe. It is a little pricey (considering how short the crossing is) however saves you a very long drive. Be wary as once over the other side single track roads and rogue sheep are common. 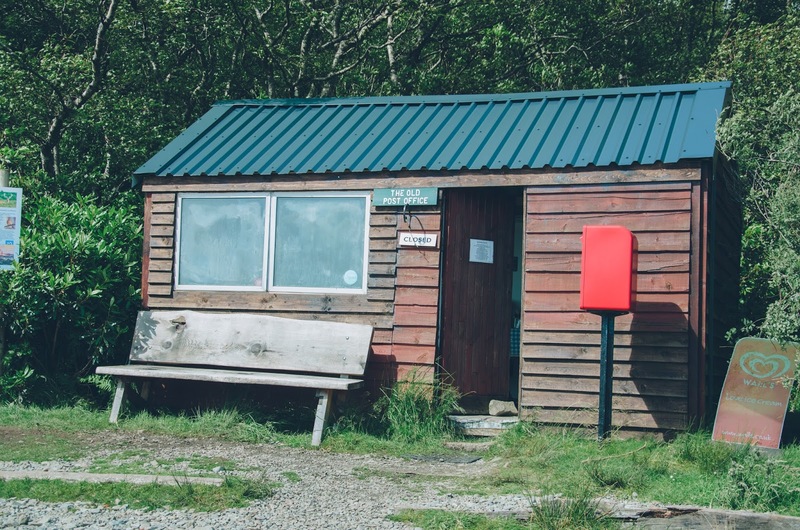 It makes for a very fun drive if it’s quiet however you often get stuck behind the ever dreaded caravan brigade… Once you arrive at Lochaline there is a snack van, public loos & waiting area for the crossing which doesn’t take long at all. 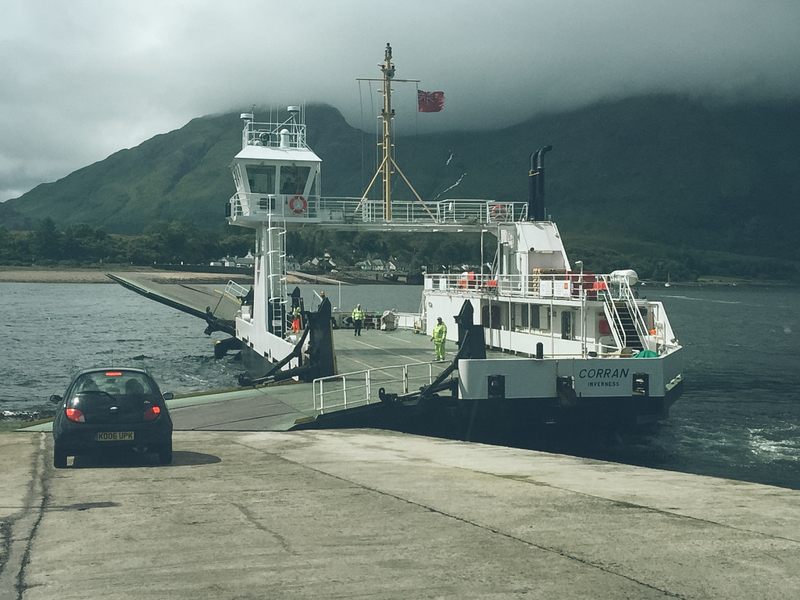 Here you will get on a much larger CalMac ferry over to the island. 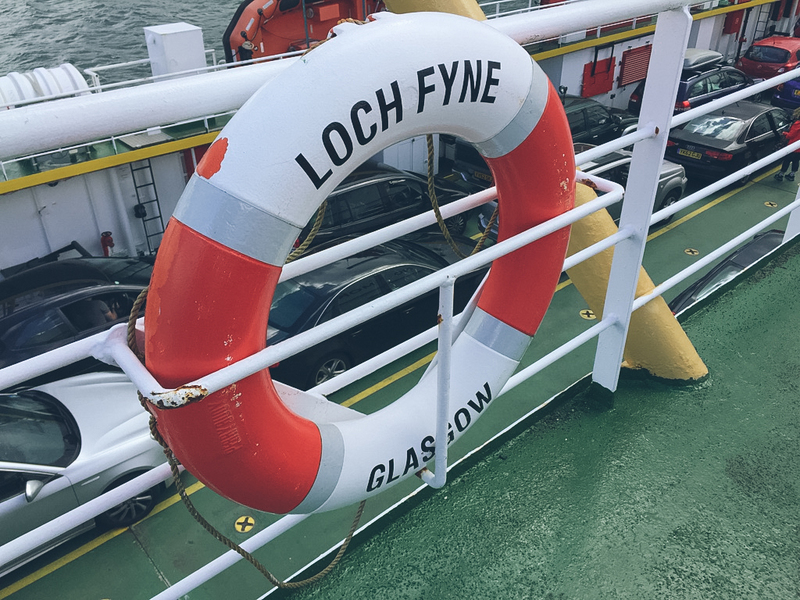 This is a popular route also – CalMac ferries will have all routes & times. 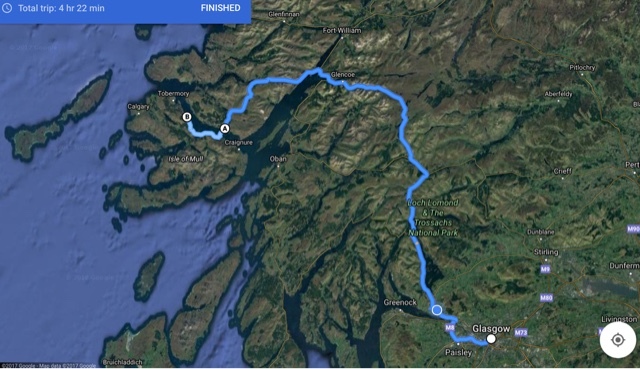 This is a much shorter route however you are missing out on the chance to drive through Glencoe if you would like to include that in your trip. As mentioned it was also the more expensive option at the time of writing. 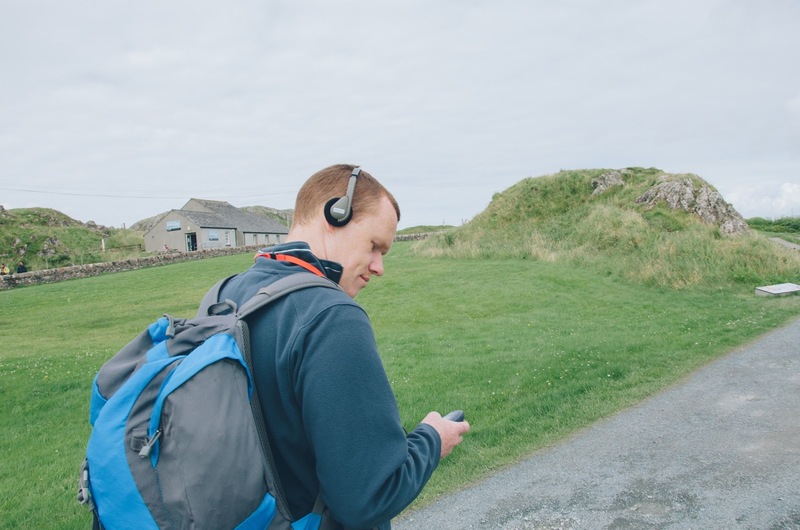 Regardless of the route you choose, I would definitely recommend booking as crossings are very popular. 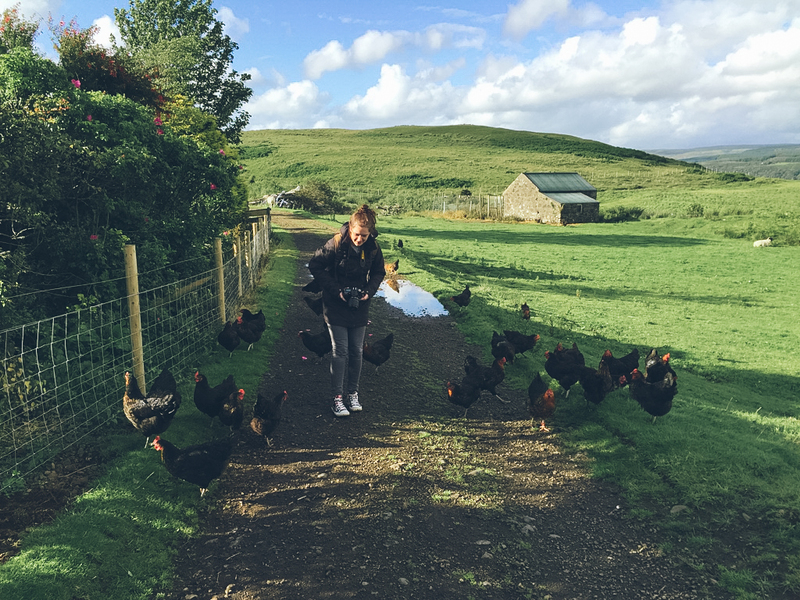 Our accommodation for the week was a wonderful working farm. 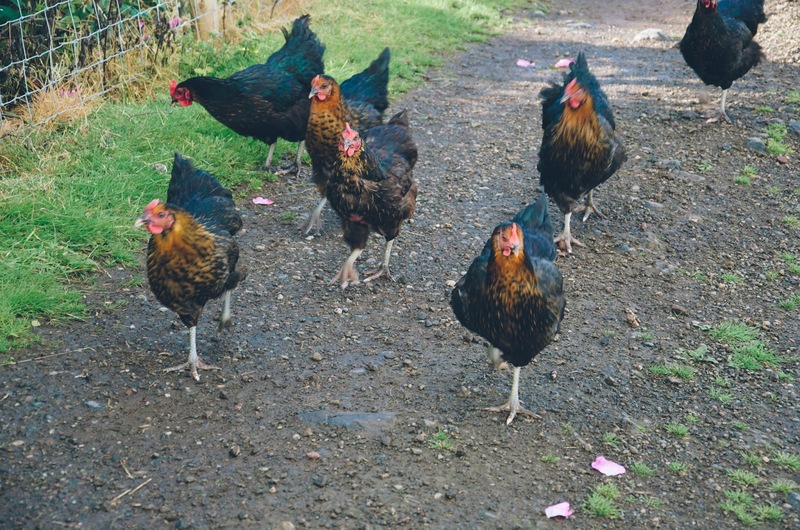 Amazing if you have kids or are just a big kid like me… As you would expect on a working farm, you bump into the other residents, namely, sheep, cows and friendly chickens that tend to flock around. 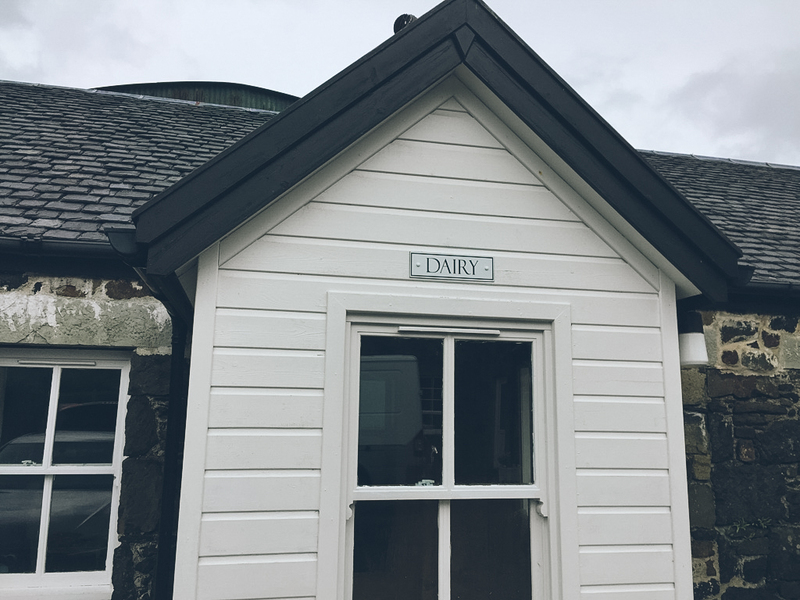 There are a variety of accommodation options depending on your requirements however we selected the Dairy which is in the main courtyard of the farm. Upon arrival we found a very comfortable 1 bedroom cottage with bathroom and a rather large kitchen / living area for just two people – however pefect for a week long stay. In the kitchen there was everything you would need for cooking which you may well want to if you purchase some produce from the farm’s honesty shop, which is directly opposite the dairy cottage. I would say that there were a couple of picky things I didn’t like about the accommodation which in the main was fantastic. There is a woodburner in the living room which once lit is lovely and cosy however we found it difficult to get the room quite as warm as we wanted to. The radiators in this large area didn’t add much warmth either. The main issue for me was that the cottage was showerless which although not the end of the world would have been nice. Overall this place was a fantastic base close to Tobermory. 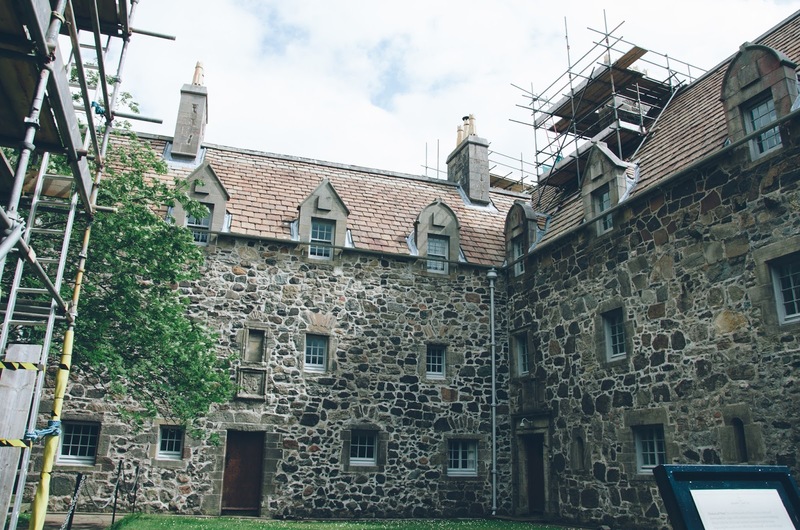 There was a lot of information in the cottage to aid with planning and it’s worth reading about the site’s history. 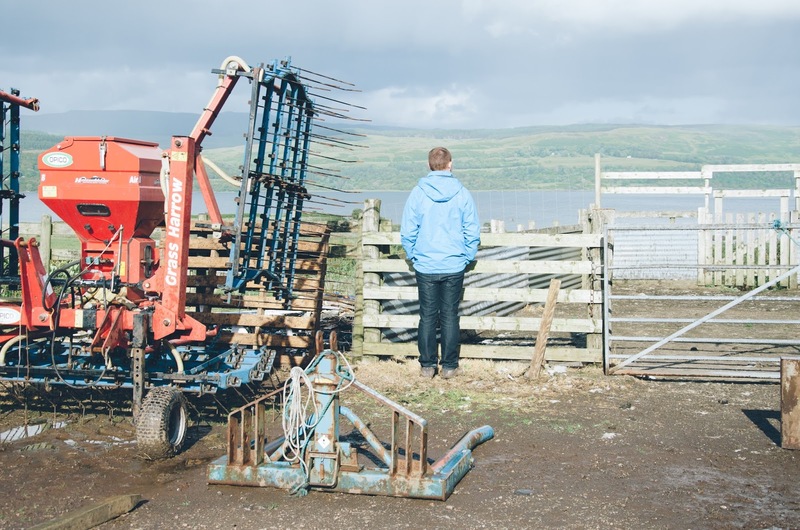 There are also a couple of walks you can do from the farm to the shore. The owners are very friendly and there to help if you need any information at all, but are also not intrusive – the perfect hosts really. 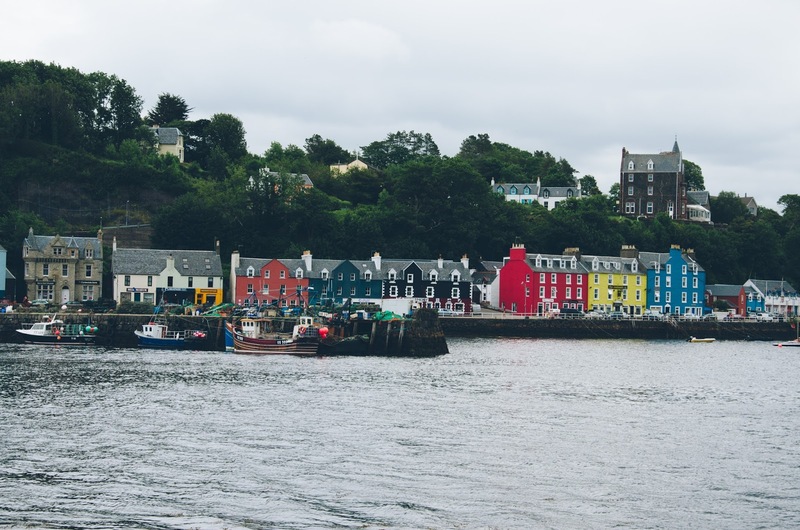 Tobermory is one of the most iconic Scottish island locations with its brightly coloured houses. 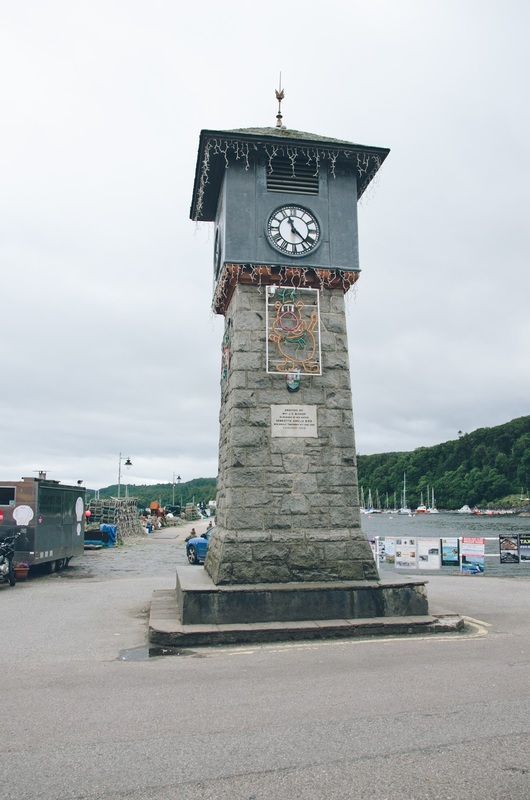 You may recognise it from the popular children’s programme Balamory which was filmed here. This is a great place to start your exploration of the island. There are plenty of shops, an aquarium and a wildlife centre (sorry can’t remember the name!) where you can book various boat trips. There’s a sign outside that tells you the latest wildlife spotted in the surrounding area. Whilst here we visited the little museum on the Main Street which is free and well worth a visit. 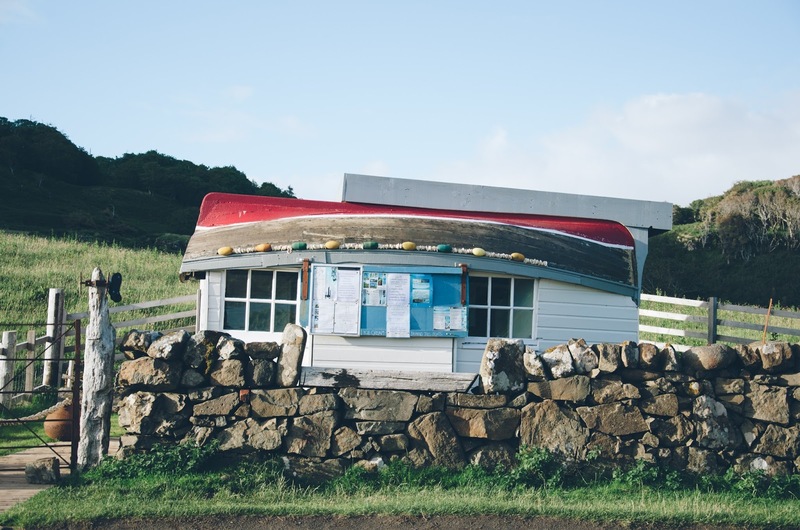 It has a few different exhibits on the history of the island, island life and even some artefacts about various shipwrecks in the area. It doesn’t look much however there’s actually more here than meets the eye. I must mention my favourite eatery in Tobermory – the Island bakery! This bakery make my favourite lemon melt shortbread biscuits, which thankfully I can now get at home so I never need to go without! Needless to say I was very excited about eating here.This was jam packed at breakfast time (always a good sign) and we didn’t manage to get a seat however I chose a salted caramel & white chocolate shortcake to take away which was delicious! 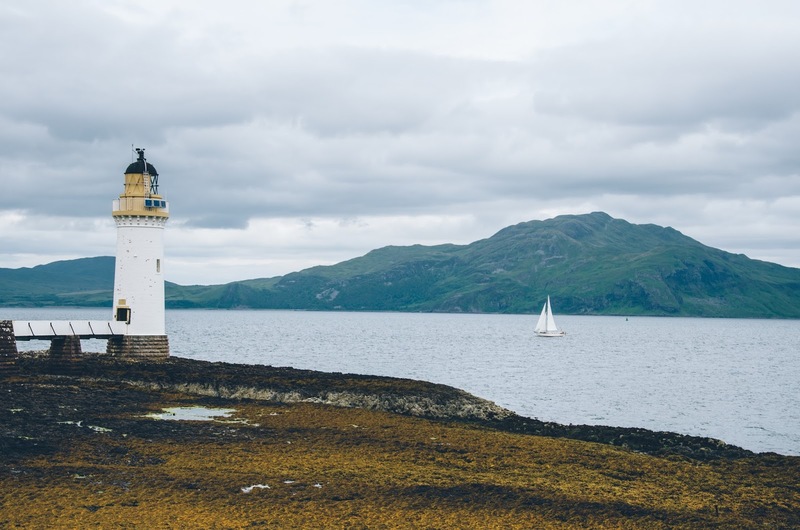 After a little potter around Tobermory we ventured on a walk to the lighthouse which, as the path was closed was a bit of a disaster. We ended up going off-road and winging our route. Hopefully this path is back open now & not as muddy. 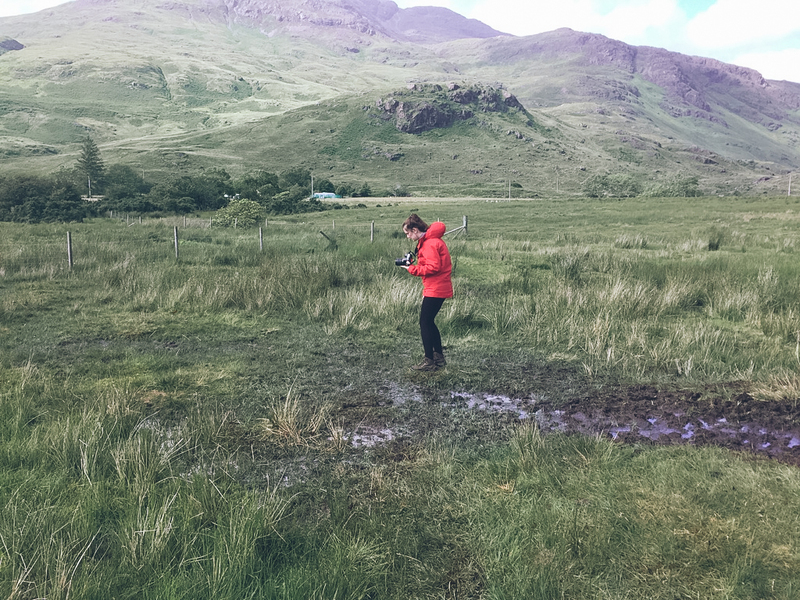 Definitely wear your walking boots doing this. 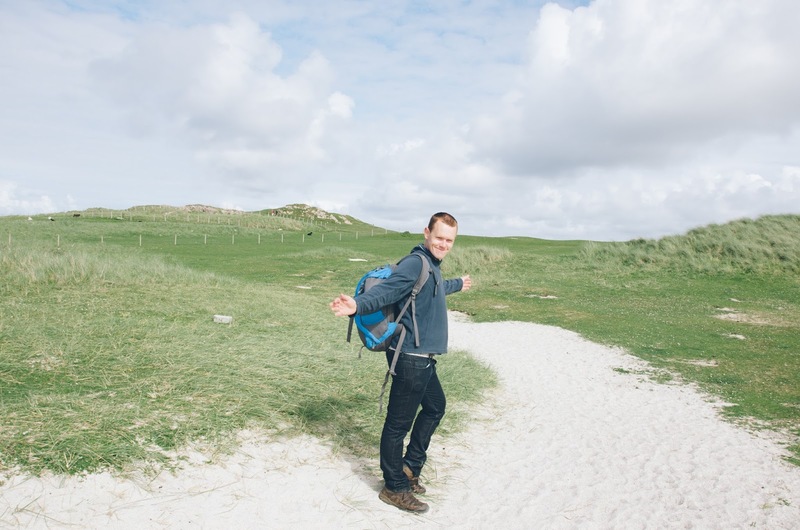 One day of the trip we decided to explore the South of the island and so set off for Laggan Sands. This was quite a drive however we soon arrived at a little makeshift car park overlooking the beach. One of my favourite things was discovering the honesty shop. Just in case you don’t know an honesty shop is, it is basically an unmanned shop where you select what you want, pop your payment in a dish & take your own change. 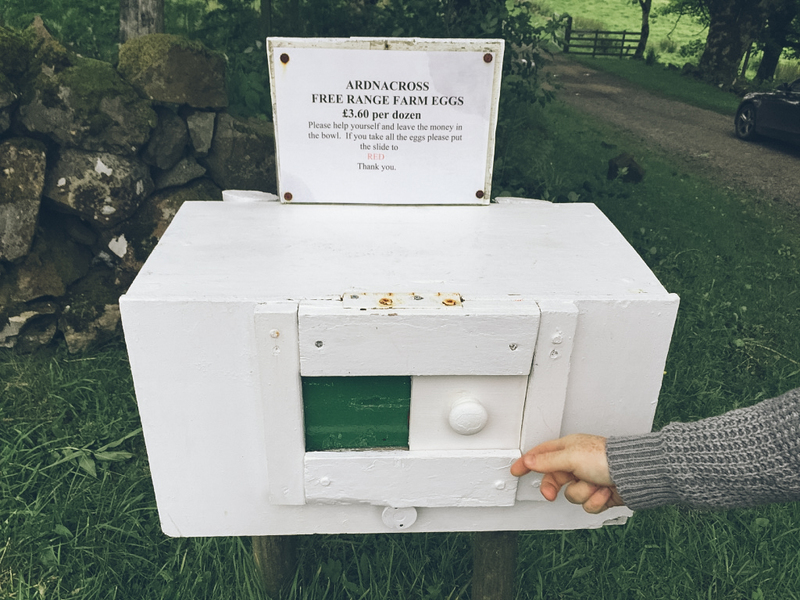 It is very common to see little boxes around the island selling eggs, jam etc that work in the same way (there’s a pic above of the one at Ardnacross farm). There was something special about this one however, perhaps because it was in such a remote location. Inside there were handmade goods and some snacks. We selected some caramel shortcake to eat on our walk on the beach. 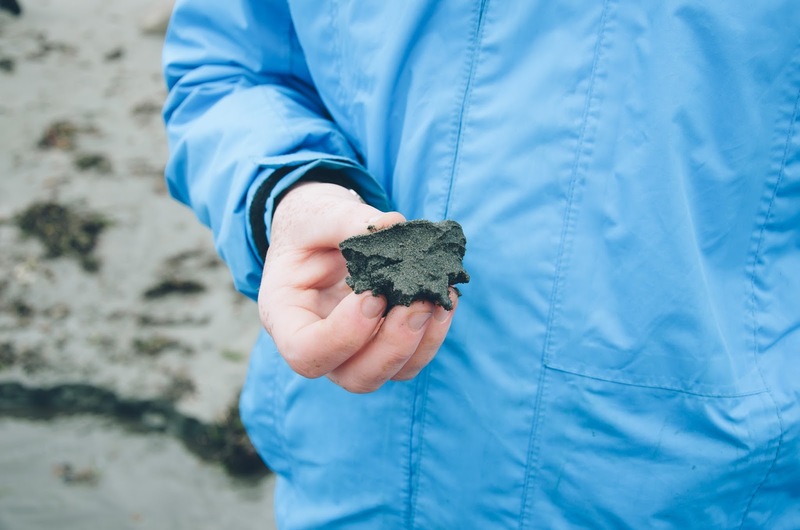 As you may have noticed from the photograph above, the sands on this beach are black as they have been ground from the basalt! If you take a stroll down the coast you will pass Moy Castle which sadly is not much more than a ruin now. 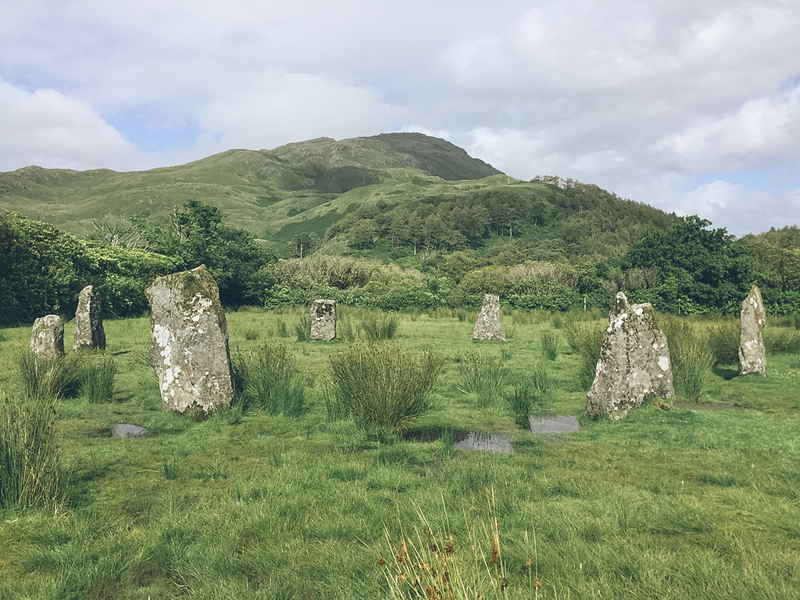 About 5 minutes back down the road in the car you can visit the Lochbuie stone circle. 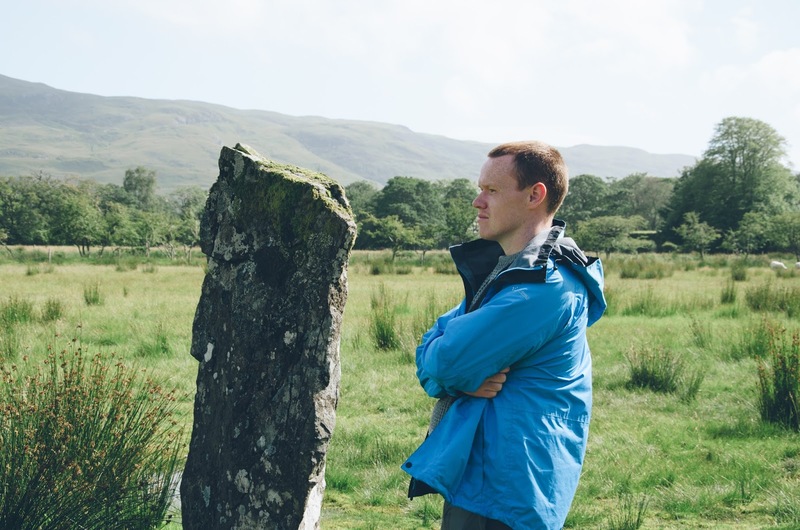 You have to traverse across extremely boggy and muddy fields to get to the circle, following white boulders, which is difficult when you realise what you thought was a boulder was in fact a sheep sitting down… This is well worth the effort though as you will be rewarded with a rather eerie and captivating sight. 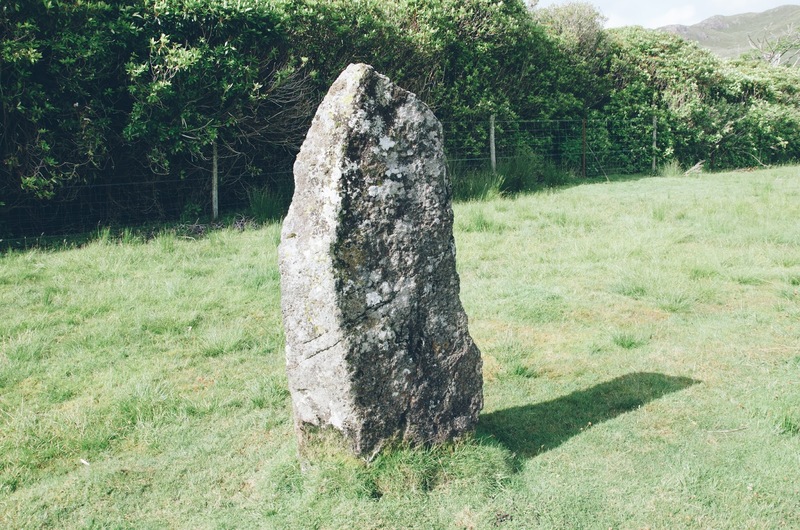 It is by no means the largest stone circle, however I have visited the famous Callanish Stones on the Isle of Lewis and I can say hand on heart I preferred these as they were not overrun by tourists. We had the place to ourselves so there was a wonderful atmosphere as we looked around and pondered on how much or little the area had changed since they were first placed. Armed with a new camera on this trip I was very keen to go on a boat trip to see the puffins! 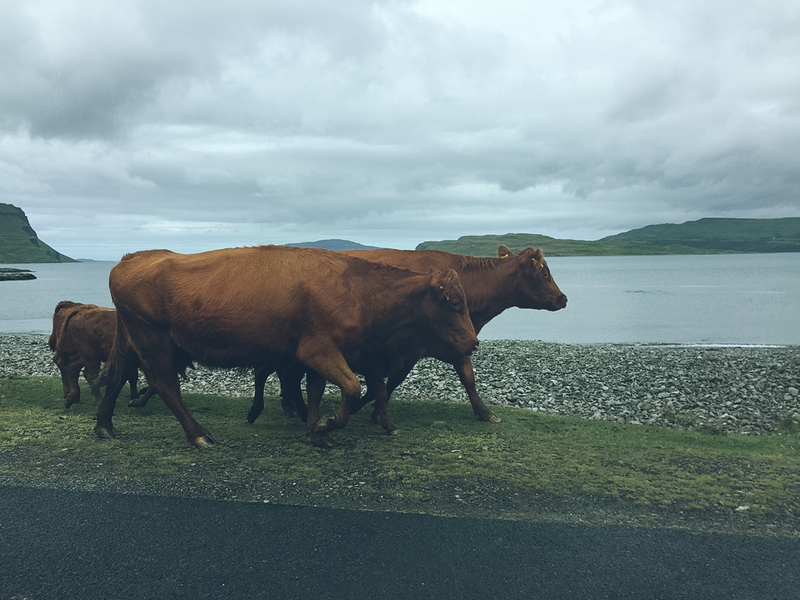 We booked with a family run business called Turus Mara that depart from Ulva (look into Ulva if you like walking as this is a very interesting little island). 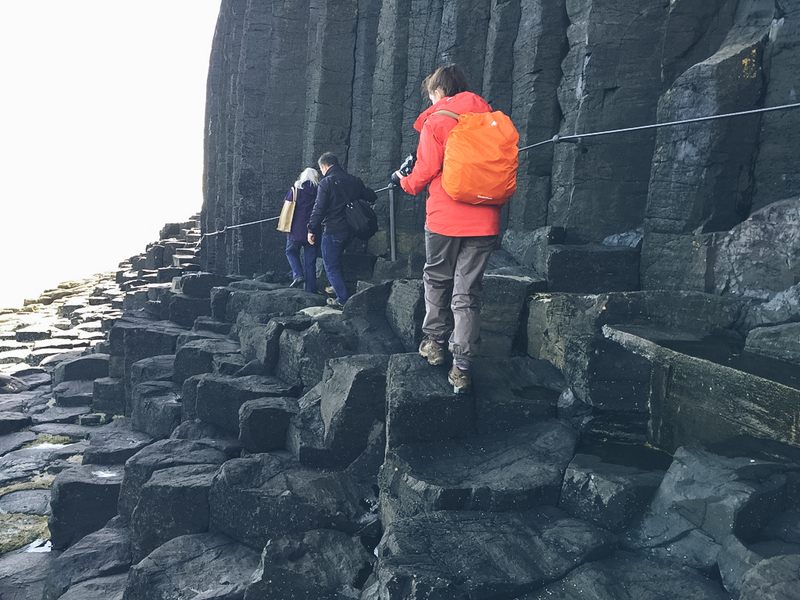 The trip took in the Treshnish Isles with time on Lunga to see the Puffins and Staffa to see Fingal’s Cave. It is worth mentioning that this is quite an expensive trip however you do get a lot of time onshore. Be prepared for the elements. This is a long boat journey and there isn’t any protection from the weather on the boat or on the islands either. It will be a long day if you are cold and wet. I would also give this a miss if access is an issue. 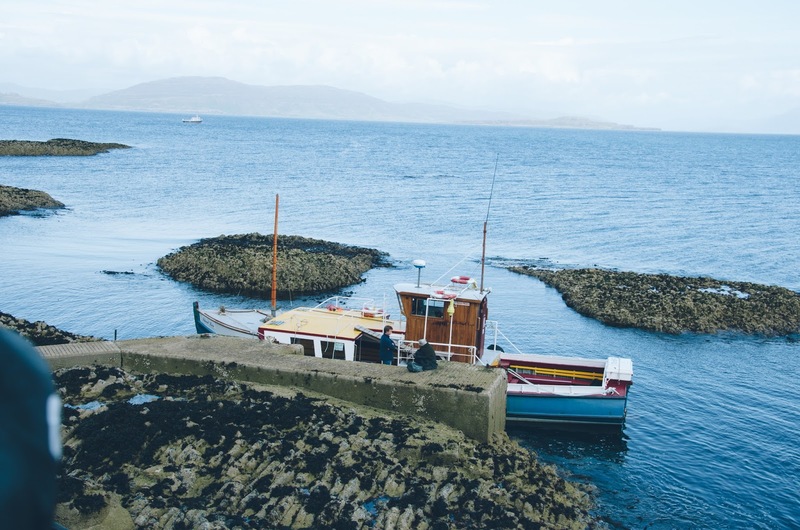 You must be prepared to disembark the boat on to small landing areas and walk over slippery rocks and uneven ground. Someone fell whilst we were there, fortunately they were okay however please bear this in mind & wear appropriate footwear. The overwhelming feeling on this trip is of the isolation on these islands. You very much feel like you are at the end of the earth. 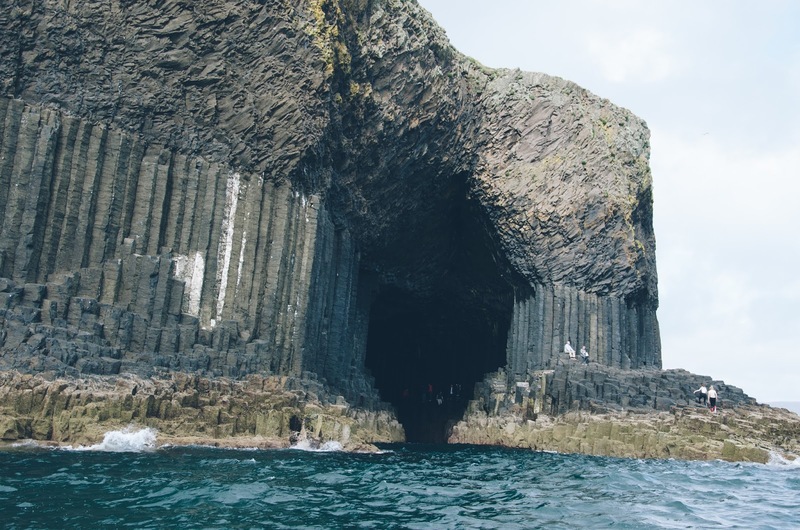 It is perhaps this magical quality that adds to the impressiveness of Fingal’s Cave. 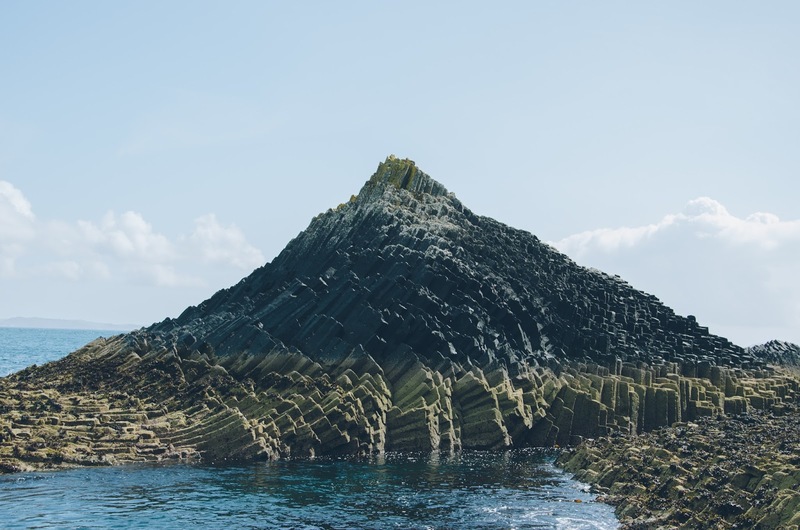 These basalt columns are from the same lava flow as the Giant’s Causeway in Ireland & are thought to be behind the legend of Fionn or Finn and the Giant’s Causeway. This was a very grand site however it was very busy getting into the caves and pretty treacherous. As you can see in the photos you only have a metal rope to hold on to, so you have to be very careful with so many people going into the cave. You don’t really have time to stop and enjoy the inside of the cave & I felt it was best appreciated from the water. Next we sailed to Lunga to see the puffins however much to my dismay we were at the end of the puffin breeding season!! After 2hours of patiently waiting, the little head of the final puffin popped up from his burrow right next to us, which made it all worthwhile. I did get rather annoyed at other tourists who, despite being advised not to, stood on top of the puffins’ burrows. You have to be really careful as this can injure the puffins and you should stand well back. I feel that there should be advisers dotted around the island to prevent this. 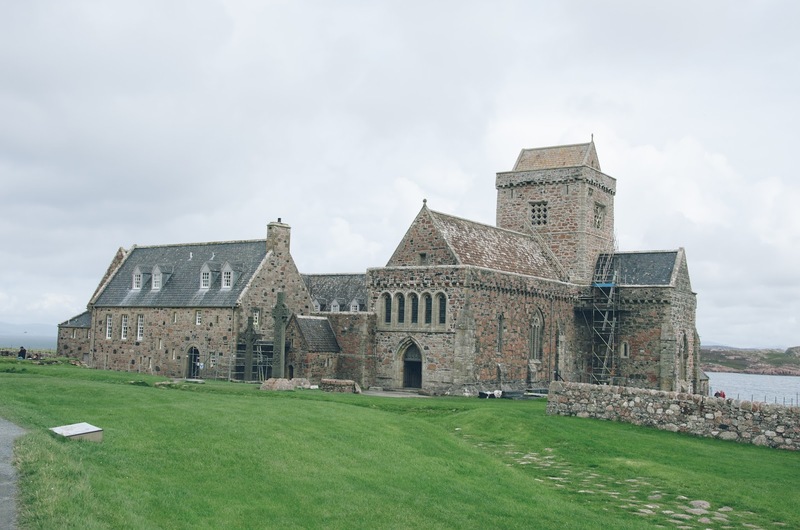 One of my favourite days of the trip was our visit to Iona Abbey. 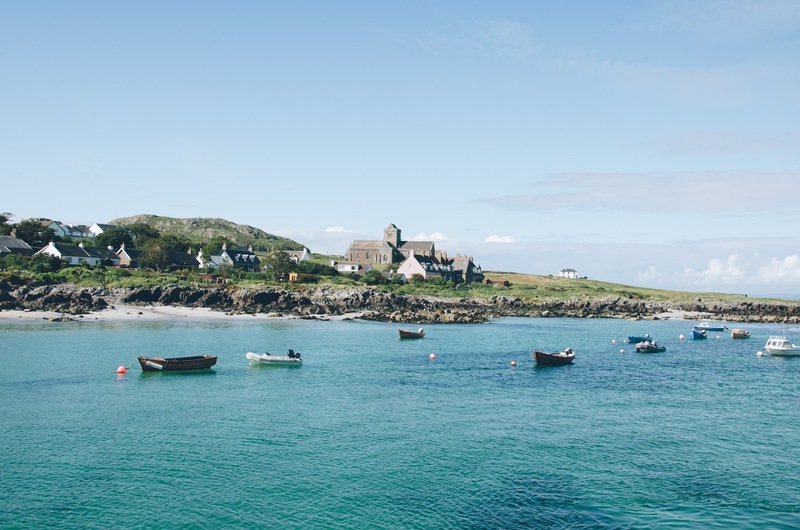 We headed to Fionnphort where we caught the CalMac ferry for a very brief crossing. 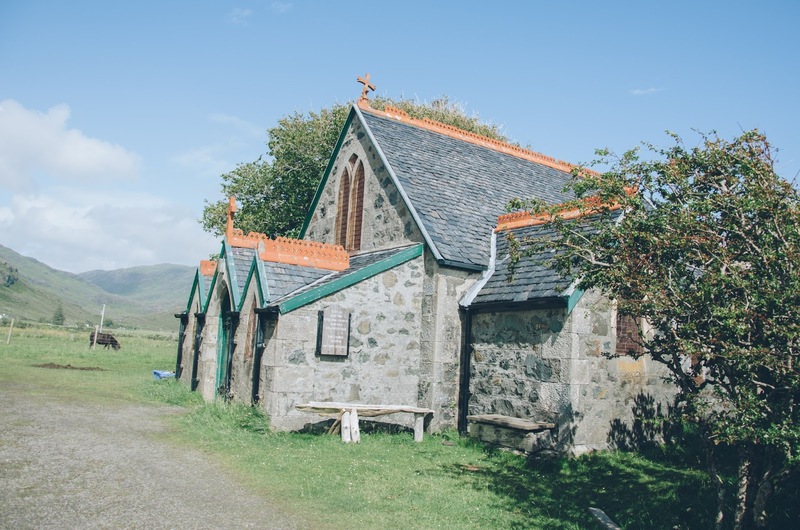 We walked up through the village and found ourselves at a little museum and then discovered a tearoom, however we had made a rookie mistake – most places on Iona take cash only so please remember this before you go! 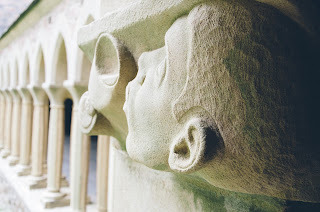 After wandering around some of the ruins near the village we headed over to the main Abbey where in a very out of place, modern reception, we paid for the audio tour (the staff here were really friendly). 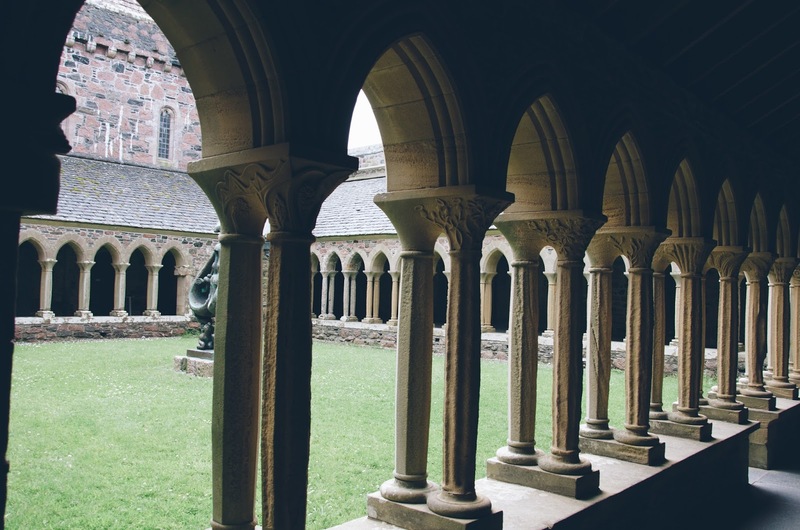 The tour was worth the price / very informative and gave us access to the main abbey buildings. 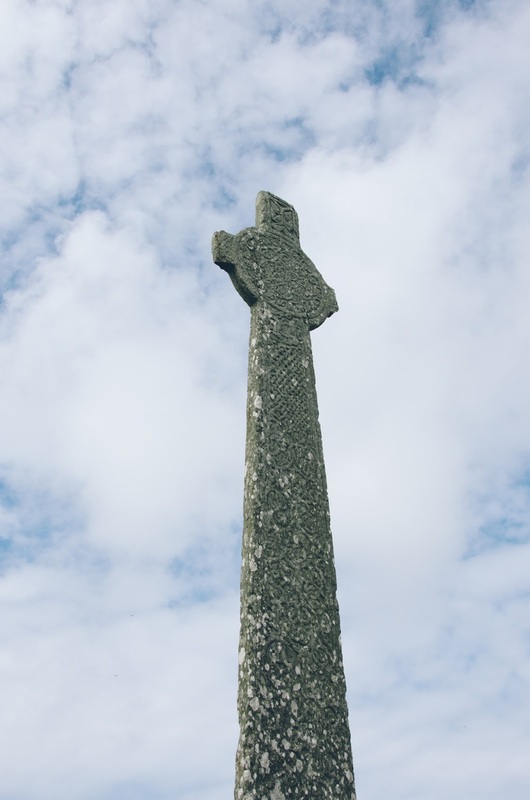 Be sure not to miss the special exhibit of Celtic crosses. After our tour we continued to the end of the path where we happened upon the most amazing beach which was covered in coloured stones. A superb place to relax, take a book or just enjoy the view. Just a brief mention of this wonderful park. 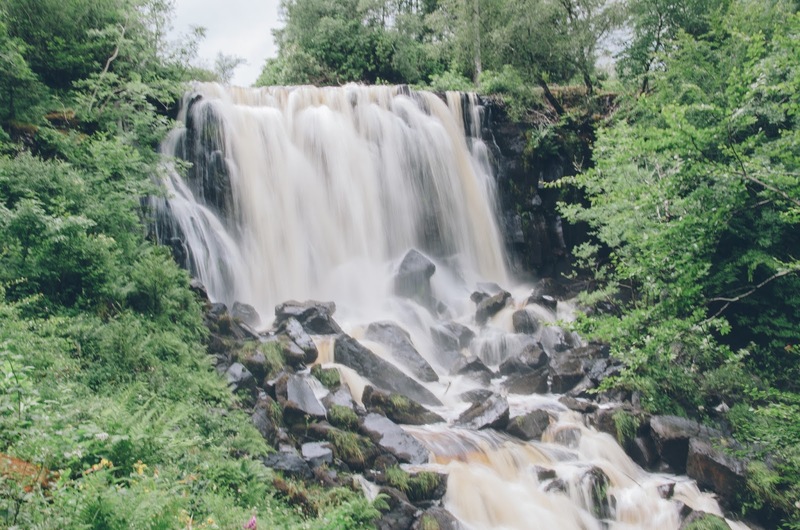 There are many walks however even if that’s not your cup of tea, there is a viewing deck over very impressive waterfalls! 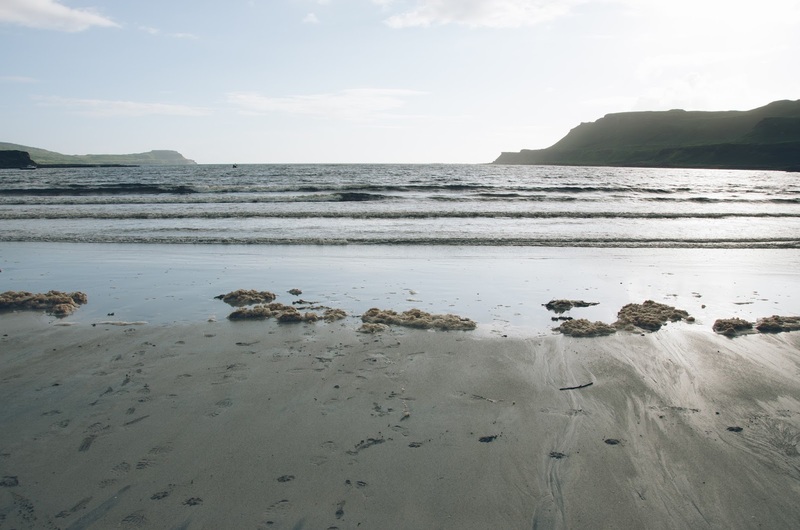 This beach is another ‘not to be missed’ place on the island. We were lucky enough to be there on a beautiful day out of season and had the beach to ourselves. There is a camp site nearby and I reckon this would be a pretty awesome view to wake up to. 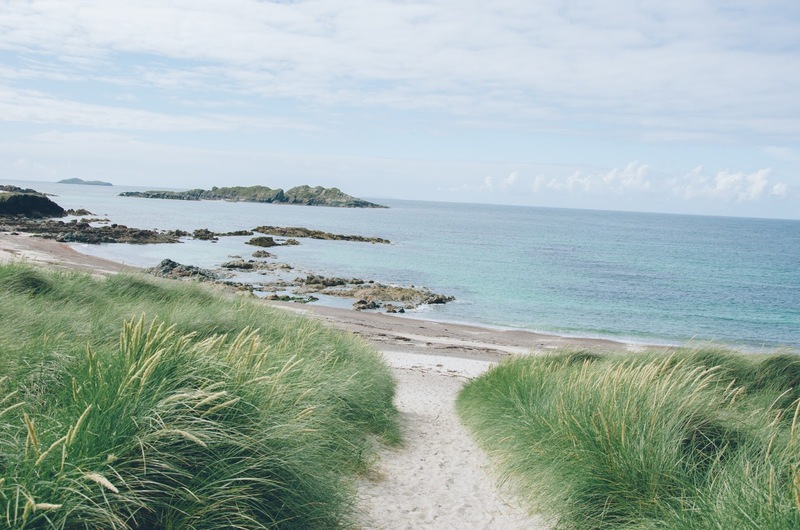 Here Machair can be found. This is a protected type of grass which can house many types of flora. If seen at certain times of year this can be spectacular. 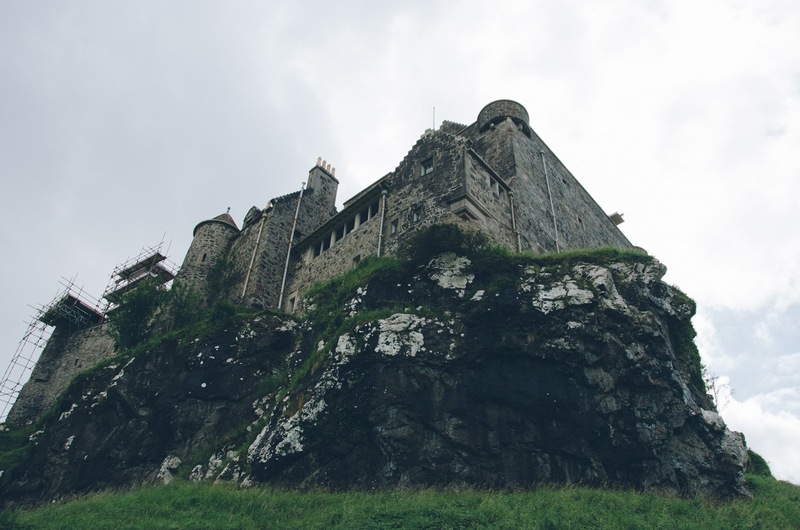 You can see we visited Duart Castle on a particularly grey day & it is a good way to keep occupied if the weather is not on your side. 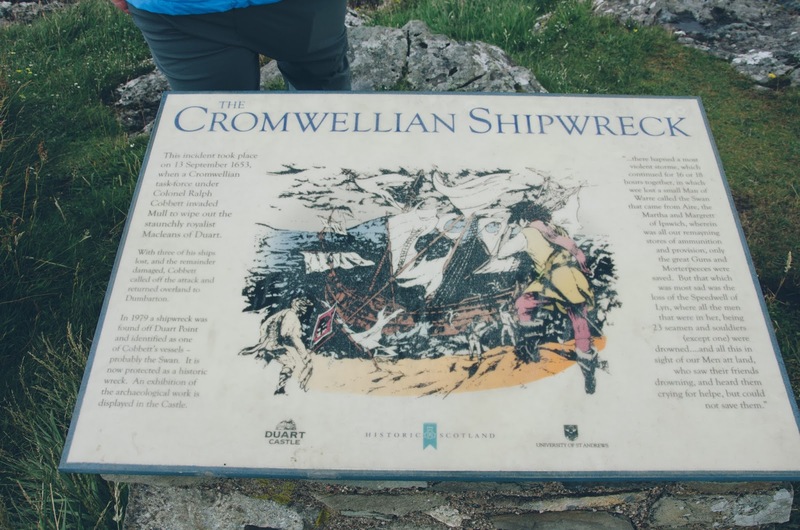 It has some cracking views over the coastline & more information about the island’s shipwrecks including some from the Spanish Armada! After soaking up some history you can have some lovely homemade soup & cakes in the castle tearoom. 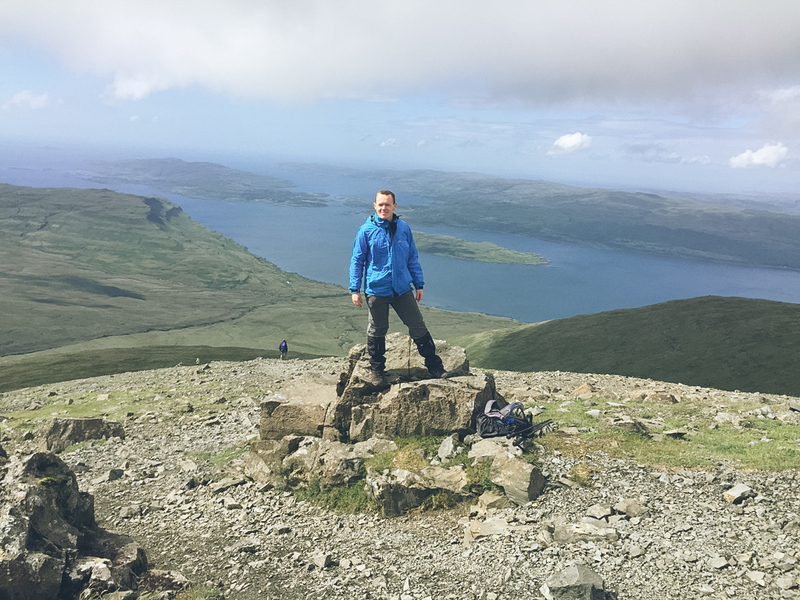 Ben More is interestingly the only Munro you have to sail to since the construction of the Skye bridge. Being self confessed Munro Baggers we had to include this in our trip. It also provides you with amazing vistas of the island and the chance to explore an area you might otherwise miss. 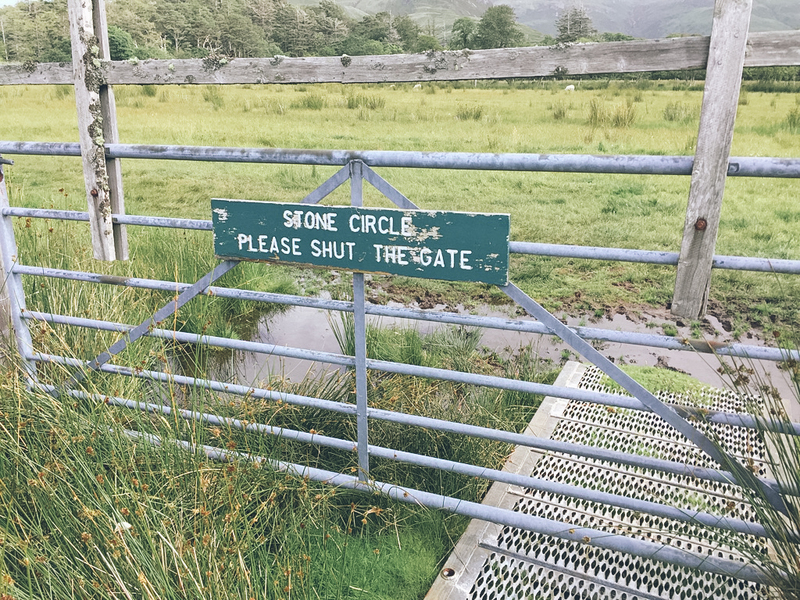 Crafts & Things – Glencoe pit-stop, good for souvenirs. Worst roads of any of the islands we have visited. We had a ripped tyre from the rough roads down to Laggan Sands! There is a garage in Tobermory however better to travel in a 4×4 if possible.